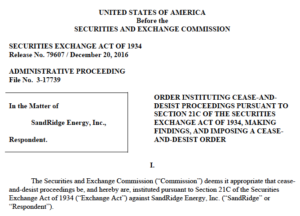 On December 20, 2016, the U.S. Securities and Exchange Commission (“SEC”) entered an Order fining SandRidge Energy, Inc. (“SandRidge”) $1.4 million for violating SEC whistleblower anti-retaliation rules. First, SandRidge’s separation agreements prohibited former employees from voluntarily cooperating with government agencies including the SEC. The separation agreements also included confidentiality and non-disparagement provisions that applied to government agencies. Second, the SEC found that SandRidge retaliated against an employee who blew the whistle internally. The employee reported concerns about potential securities law violations to SandRidge. The Order does not say that the whistleblower reported those concerns to the SEC. For several years, SandRidge used a form separation agreement that prohibited former employees from voluntarily cooperating with governmental agencies. That provision stated in part that former employees could not “voluntarily contact or participate with any governmental agency in connection with any complaint or investigation pertaining to the Company”. SandRidge’s separation agreements also contained a confidentiality provision that barred former employees from using or disclosing to anyone “including any governmental agency, any of the Company’s confidential, proprietary information unless [the employee] obtain[ed] the Company’s prior written consent”. The Commission determined that these provisions violated SEC whistleblower anti-retaliation rules and protections. Over a period of roughly three years and eight months, approximately 546 of SandRidge’s former employees signed separation agreements containing some or all of these provisions. According to the Order, these provisions did not address “merely a hypothetical concern” that SandRidge had: “Many of the violative separation agreements were in place, and a large number of agreements were executed, at times when SandRidge was subject to investigation by the Commission”. The Order stated that the SEC could not determine whether any of SandRidge’s former employees refrained from communicating with the SEC due to these provisions. However, the Order also said that at some point during its investigation, the SEC contacted SandRidge about the separation agreements, and that SandRidge amended the problematic provisions and informed its former employees that those provisions “were no longer in effect”. Nevertheless, even after those amendments had been made, a former SandRidge employee refused to speak voluntarily with the SEC staff due to the original language in the separation agreement that he/she had signed. Over approximately a two and one-half year period, an employee at SandRidge expressed concerns to SandRidge’s senior management about the company’s process for calculating certain figures that the company included in its periodic reports filed with the SEC. Due to the whistleblower’s concerns, the draft audit report was revised. However, “the internal audit was never completed and a final version of the report was never disseminated to the company’s Board of Directors or Audit Committee”. A few weeks later, the whistleblower asked to be recused from a project because of what he/she called an “ethical issue” with a methodology that was being used for the project. Approximately one month later, SandRidge senior management discussed the possibility of terminating the whistleblower’s employment. In addition, SandRidge searched the whistleblower’s e-mails over the preceding year to determine whether the whistleblower had sent any external e-mails (a) disparaging the company, or (b) using terms related to the concerns the whistleblower had raised. One term that SandRidge searched the e-mails for was “SEC”. Subsequently, SandRidge terminated the internal whistleblower’s employment. According to the SEC’s Order, “At that time, SandRidge had not investigated the Whistleblower’s concerns … other than conducting its incomplete internal audit”. According to the SEC, the separation agreement that SandRidge presented to the whistleblower contained the provisions discussed above, in violation of SEC whistleblower anti-retaliation protections. The SEC’s press release about the case quoted the Director of its Fort Worth Regional Office: “Ignoring a rule that protects communications between outgoing employees and the SEC, SandRidge flatly prohibited such contact in their separation agreements and at the same time retaliated against an employee who raised concerns about the company to its management”. The SEC found that SandRidge violated the SEC whistleblower anti-retaliation provisions of Section 21F(h) of the Securities Exchange Act of 1934 and SEC whistleblower rule 21F-17. As a result, the Order imposed a civil monetary penalty on SandRidge in the amount of $1.4 million. In the press release, the Chief of the SEC’s Office of the Whistleblower announced, “This is the first time a company is being charged for retaliating against an internal whistleblower”. She also asserted that “Whistleblowers who step forward and raise concerns internally to their companies about potential securities law violations should be protected from retaliation regardless of whether they have filed a complaint with the SEC”.